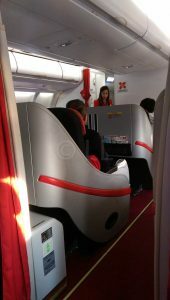 7 unusual places to say "I Do"
Selecting the best seat on an aircraft is very subjective and we look here at AirAsia X, which currently flies a single type of aircraft, an Airbus A330-300, to help you find your best standard AirAsia X seat. 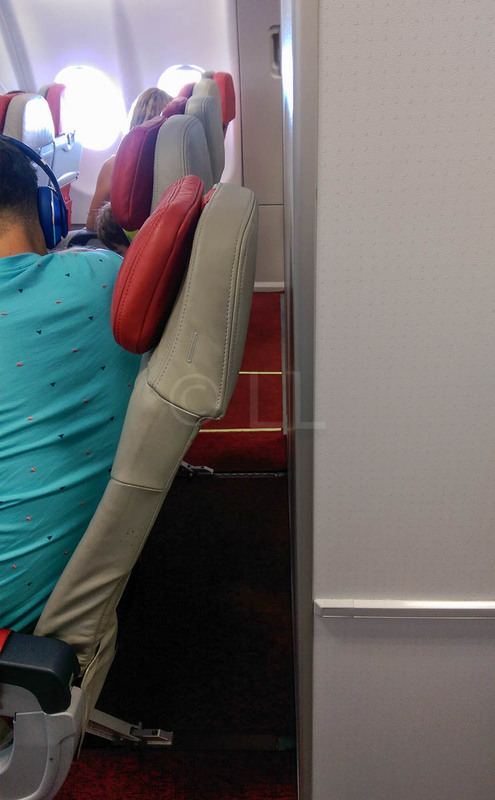 There are no entertainment units installed below seats, so there is room to stretch out. Do you require easy access to the exit or a toilet? To access the toilet easily choose a seat at the front or rear of the cabin. Do you want to get your meals first? Pre-book your meal as these are distributed before the general meal service. 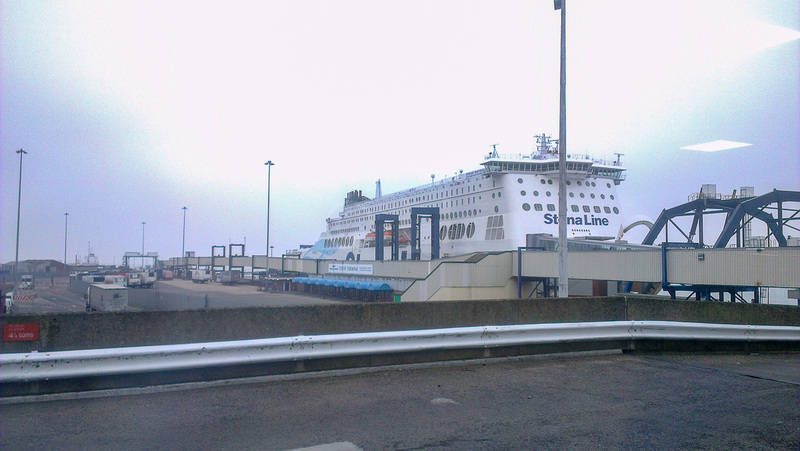 Otherwise sit towards the front of the cabin as the meals are served from the front first. Do you want to take photos out the window? Do you want a quiet place to sleep or read? Select a seat in the Quiet zone. Do you want to pay for a ‘better’ seat? Various pricing structures are available – hot seats are the most expensive. See below. Do you require wifi / power / entertainment? 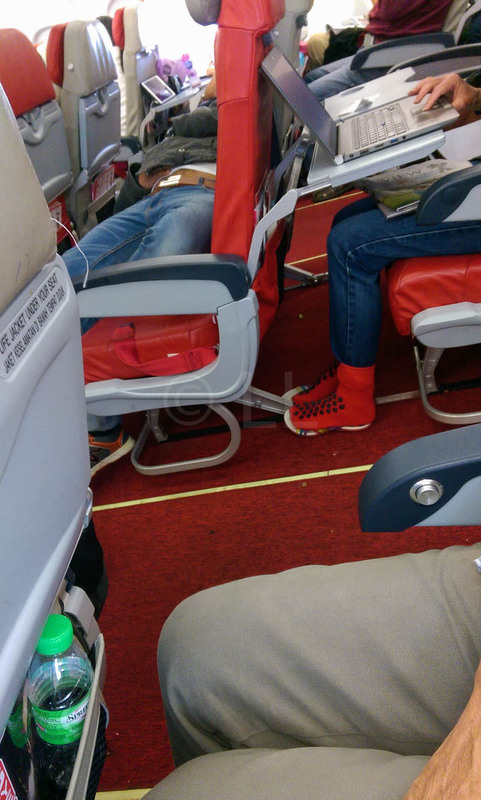 There are no power outlets in the AirAsia A330 aircraft. Entertainment is pay to use, subject to availability. You can pre-book entertainment online. AirAsia X offers a choice of 12 Premium seats, with the balance of the seating consisting of 365 standard sized seats across three cabins, the first of which is a ‘Quiet Zone‘. You have two choices of seat selection on an AirAsia X flight – you either pay for your preferred seat, or you take your chances at check-in. If you’ve decided you are prepared to pay for your preferred seat before you leave, here are a few tips to help you make your choice of the best standard AirAsia X seat. The Premium seats at the front of the cabin are the most expensive as they are flatbed business class seats with AC power. There are twelve of these seats, arranged in twos across two aisles, in two rows (A/C, D/G and H/K, A and K being window seats). 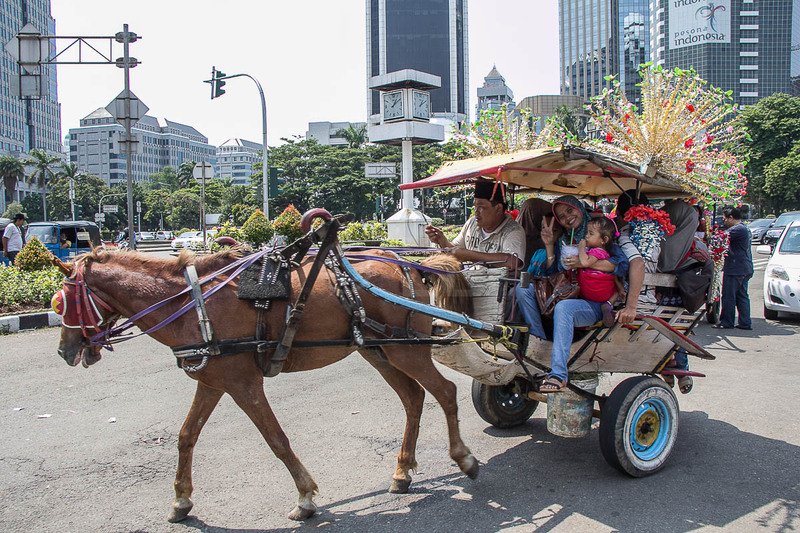 Passengers in the Premium cabin enjoy complimentary baggage allowance, food and blanket / pillow. 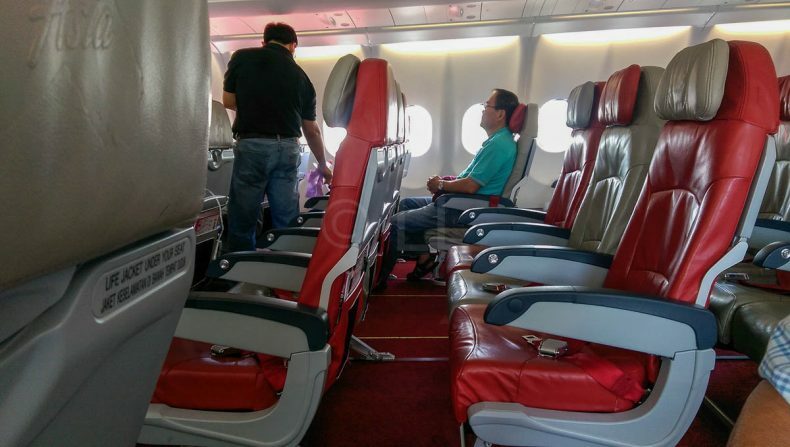 All AirAsia X A330s have their economy seats configured in a 3-3-3 layout, A/B/C, D/F/G and H/J/K, with A and K being window seats. Rows 44-51 are arranged in a 2-3-2 configuration. Seats between Rows 20 and 33 are over the wing. However, there are no exit rows in this section, unlike in some aircraft. So you do not have to worry about lack of seat recline, but neither do you have extra legroom or a view out the window. 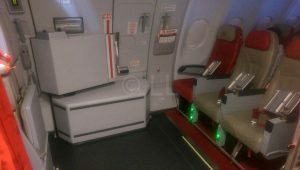 Most economy seats are a standard price, however ‘hot seats’ will cost you significantly extra – these are generally Exit Row seats. You will also pay extra to sit in the quiet zone between rows 7 and 14, it’s quieter because it’s at the front, but also because children below are not allowed in this section. There is no Row 13. Row 14 has no window. 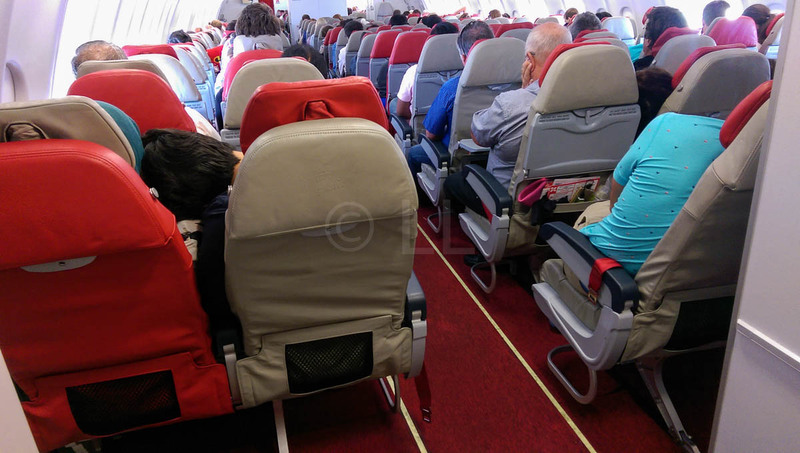 If you select an Exit Row seat, you will have extra leg room, although the door slides may reduce this for those sitting in the A and K seats as they protrude into the cabin space. 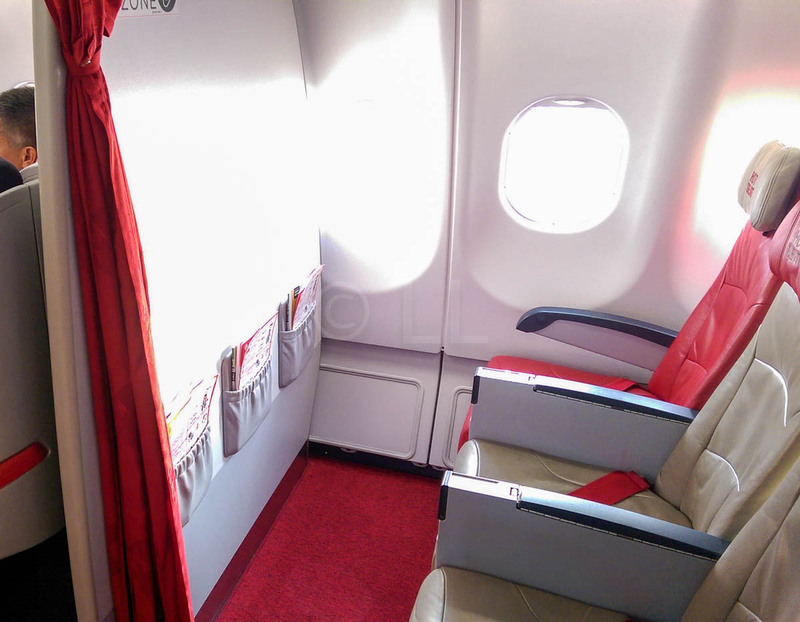 The seat width is also reduced a little and the armrests cannot be raised because the tray tables are set inside them. The Standard seats come with a fairly generous pitch of 31″ which gives a bit more legroom. The seat width between the armrests (which can be raised, though they don’t always seem to stay up) is 161/2“. All seats, including those in the exit and rear rows, do recline and all are equipped with a coat hook on the side of the seat in front. The tray table is a single flat fold-down tray, with a cup depression and a front cutout. 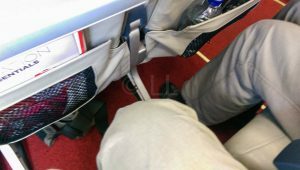 There is no power supply for seats in non-Premium cabins. The space on the tray table is adequate for a small to mid sized device especially during a longer day flight. 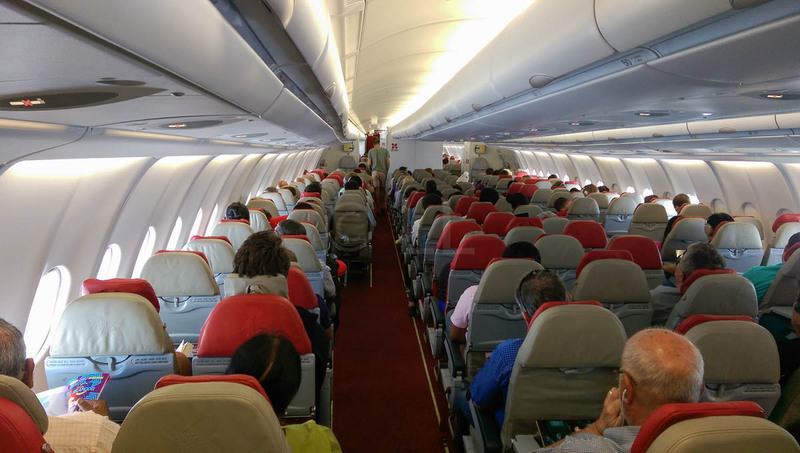 Noise: Seats behind the wing are significantly noisier than those forward of about Row 20, however, you do have more toilets available in the rear half of the aircraft. Access to the toilet: If you are bothered by people queuing for the toilet, you may wish to avoid aisle seats around Rows 16, 34 or the rear rows of 50 and 51. There is fairly generous space in front of the toilets (Seven spread across the aircraft), and people don’t generally need to wait in the aisles. 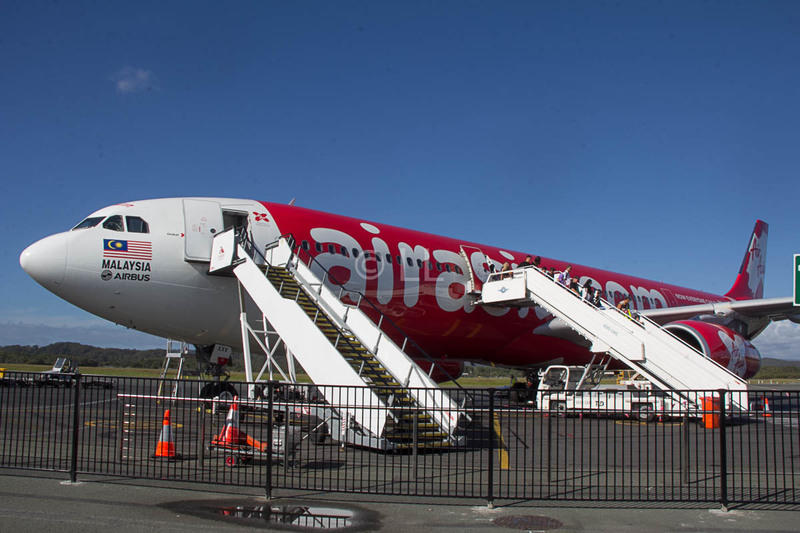 Meal Times: AirAsia X serves all the passengers who have pre-booked meals first. 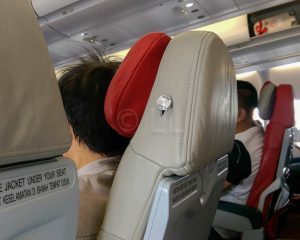 As they are cheaper and there’s more choice, this is a popular add-on, so if you are at the back of the aircraft, you may have to wait up to an hour for your meal to arrive. However, you will get to eat your preferred meal, those who want to purchase from the menu will have a reduced choice and will only be served after all the pre-booked meals are served. Taking photos: The window seats in the aircraft are A and K across all rows. The Rows above the wing (Rows 20-33) will have a less than wonderful view. If you are looking for something specific, it’s an idea to check one of the flight tracking sites (e.g. Flightradar24 or Flightaware) to see their most recent routes. While not guaranteed, you may see a panoramic view of your destination as you take-off or land, if you’ve selected your seat on the ‘correct side’. For trips over six hours or overnight, it may be worth it to pay the extra for a seat in the quiet zone, especially if you can get an empty seat beside you. There is one toilet in front of Row 17. This toilet serves the Quiet Zone and the 3rd Cabin. There is ample waiting space the other side of the toilet, so you won’t be disturbed. Seat 34E is a bassinet seat. Seats from Row 44 to 51 are arranged 2-3-2, numbered A&C, DEF and H&K. The paired seats are a good choice if you are travelling in a pair as you have only one person to climb over if you have a window seat. 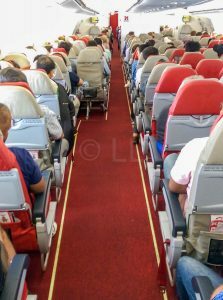 The aisle is wider at this point and there is a good 4-5″ of space between the seat and cabin wall which extends to the floor and allows more stretch room down the side. The difference can be seen in the photo above. Premium Flat seats – there are 12 of these. In the quiet zone, there is no window for seats A or K in Row 14. 15 K is partly blocked as the door slides protrude into your leg room. 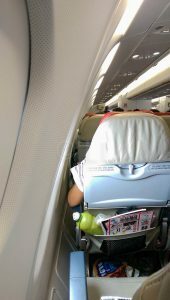 The galley is beside Row 15, so may be noisy at times. There are four toilets between Rows 33 and 34. Waiting people my disturb you. There are two toilets at the rear of the aircraft, and a galley.